20% non refundable deposit on booking, balance due 8 weeks before start date. Has to be the BEST POSITION with the BEST VAN!! Take a look at the website link which is currently a 3D tour around this fantastic van model. 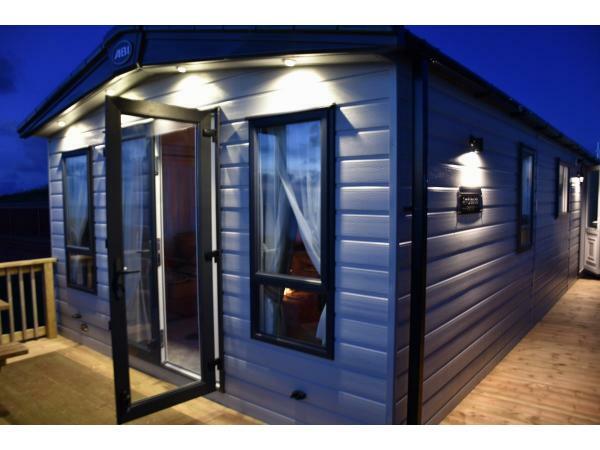 A Very High Spec ABI Ambleside Premier MK2 (14ft Premier Pack) 40ft x 14ft wide, situated at Perran Sands, Front Row close to Bay Entrance, Large Stunning Balcony with Panoramic Uninterrupted Sea Views. This stunning new van is much better than the Haven graded top of the range Platinum Vans. 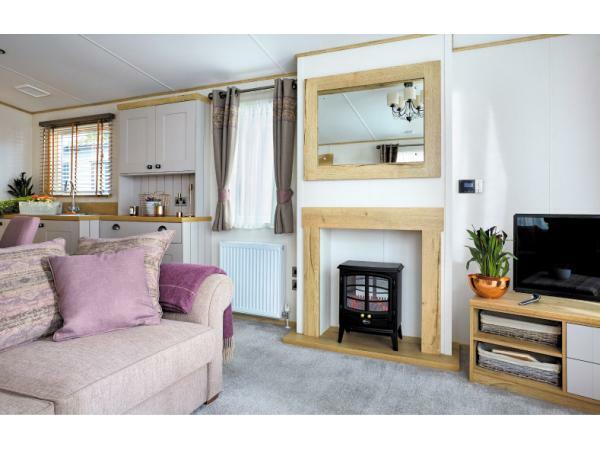 2 bedrooms, Sleeps 6: 1 double master bedroom with ensuite large shower & WC , 1 twin bedroom and 1 double sofa bed in the lounge. 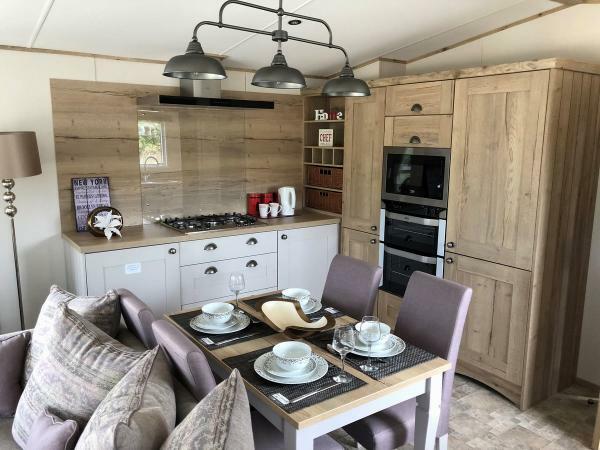 Large main bathroom and fully fitted kitchen with all mod cons including integrated washing machine, dishwasher, fridge / freezer and microwave. •	Front Row with Large Balcony, One of the very best positions in the park with ample parking & playing space. 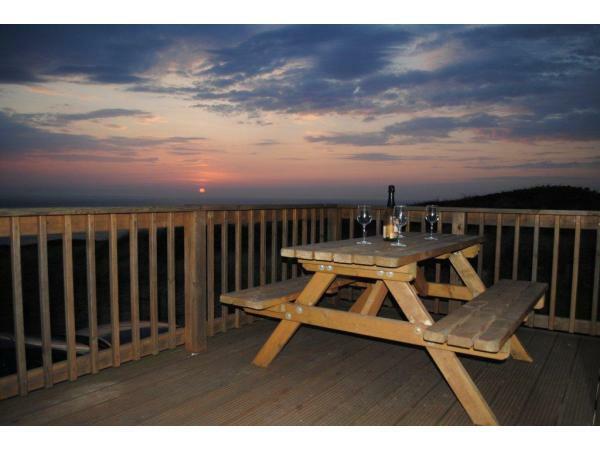 Location - Van 553, Pentreath Views - Very front row with uninterrupted sea views.. The lounge has two large settees, one of which converts to a double. There is a large 42” HD TV with Free sat, and a DVD player, next to a lovely log burner style electric fire. The French Patio Doors give access to the large veranda/balcony directly from the lounge which has a bench table and recliner chairs, so you can sit down, relax and enjoy the panoramic sea views and sun sets. As this is a 2 bed van, but still 40ft X 14ft (20% larger than most vans), this means the lounge, dining and kitchen space is extremely large, as is the master bedroom. The balcony is an “addition” to the 40X14ft, whereas some vans have the balcony is built into it therefore giving you even less space!! The kitchen is fully equipped with all the mod cons you need. Everything is integrated – Oven, 5 Burner Hob. Microwave, Washing Machine & Dishwasher. The spacious dining area has a free standing table and chairs. The Kitchen/Dining/Lounge area, the two Bedrooms and the Main Bathroom are all entered via the entrance lobby/area as you enter in the side front door where you will also find the alarm system. The lovely main/master bedroom has a king-sized bed and a large wardrobe, cupboards, dressing table and has an en-suite with a large shower, a toilet and a washbasin. There is plenty of room for a baby's cot. There is also a new wall mounted HD TV. 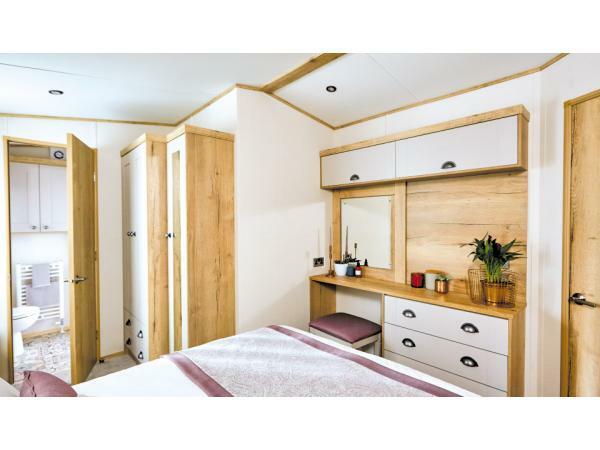 The twin bedroom which has standard sized beds that can be moved together to form another double super king size bed, plenty of cupboards and drawers and a wardrobe. We are looking at adding a TV to this room also. 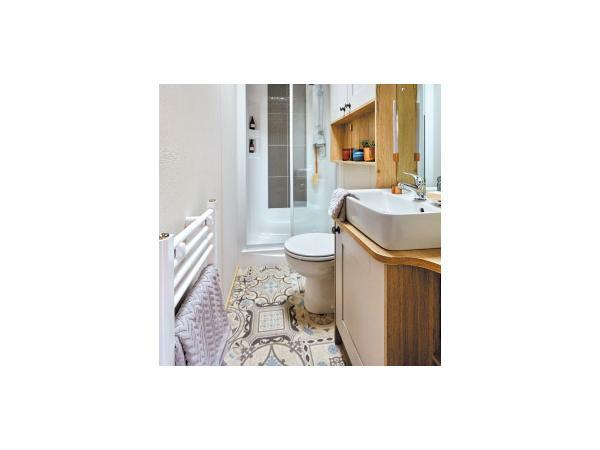 The family bathroom contains a large shower, toilet, wash basin, heated towel rail, cupboards and shelving. The van also has an inbuilt blue tooth music system complete with ceiling mounted speakers. 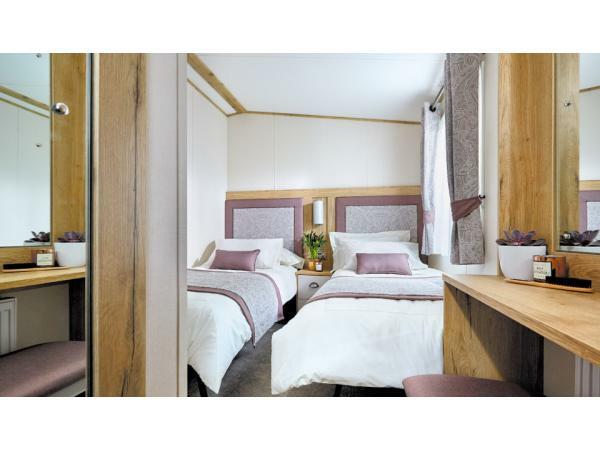 The Caravan is professional cleaned weekly and fresh good quality linen provided for beds. We ask that you bring your own towels which you can refresh using the available washing machine. Gas and Electric are included in the price. Outside, alongside the “ample” parking area there is a large lockable storage unit under the balcony so that you can store anything you want to. There is also a water supply to wash off the wetsuits etc. Also a secure entry gate with latch. Perranporth Town with large beach and nice shops, restaurants etc. Neighbouring St Agnes and Newquay. And loads more with plenty of adventure and play parks such as Flambards. 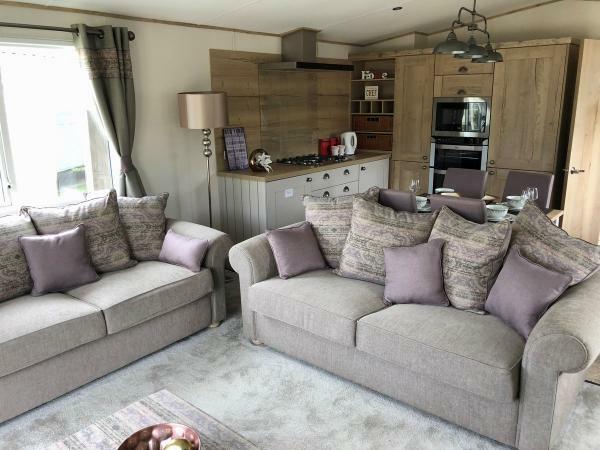 Additional Info: The small Cornish holiday town of Perranporth is close to Perran Sands Holiday Park and Truro is 15 minutes drive away. You can catch a bus from the holiday park which also travels to Newquay and St Ives. The site is situated in 500 acres of sand dunes which extends down to the famous sandy surfing beach, 3 miles long. The park is a conservation area which attracts a lot of wild life; rabbits, badgers and stoats have often been spotted around the park. You can walk over the cliffs and down to the beach to Perranporth town or stop for a pint at the Watering Hole pub on the beach. Perranporth golf club is adjacent to the holiday park. It is also fun to try and find the lost church and Oratory of St Perran buried in the dunes. Children's clubs, Children's entertainment, Shops, Launderette, Linen hire, Cot hire, Restaurant, Takeaways, Indoor and outdoor swimming pools with Lazy River, Children's pool and flume, Roller rink/disco, Amusements, Crazy golf, Football and basketball, Surf shop, 2 show bars with non-stop family entertainment. When booking your holiday a 20% deposit is required. The balance then being required 8 weeks prior to arrival.